Greek singer/musician Tatiana Manolidou comes from a musical family, and has studied piano,vocal and theory of music from an early age. She has composed music for the Greek theatre and TV, as well performing many concerts across Greece and Cyprus. She provided vocals for the album "Matricide" by Prog rockers La Tulipe Noire. 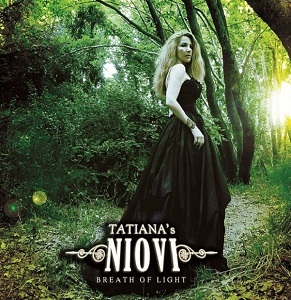 Now she's unveiled her latest work - Tatiana’s NIOVI - "Breath of light". Most of the lyrics were written by Cindy L Spear, a poet and lyricist who has written for Iona and Karnataka. The album opens with "Intro: Breath of life" which is a lovely Celtic sounding track. The album then moves quickly into "When I'm lost" which is a rock song, but still quite delicate at the same time. It's the first of three symphonic rock songs, all of which are extremely good. This is an incredibly beautiful album. It's got a strong Celtic feel at times where the vocals are hauntingly beautiful, and also has some lovely symphonic rock songs as well. The only minor downside is that the rock and Celtic tracks don't necessarily fit together perfectly - I personally would have liked to see two EP's (one for the rock and one for the other songs) rather than one album as I'm sure there are a lot of people who'd like tracks such as "Mana (Mother)" but wouldn't necessarily be rock fans.